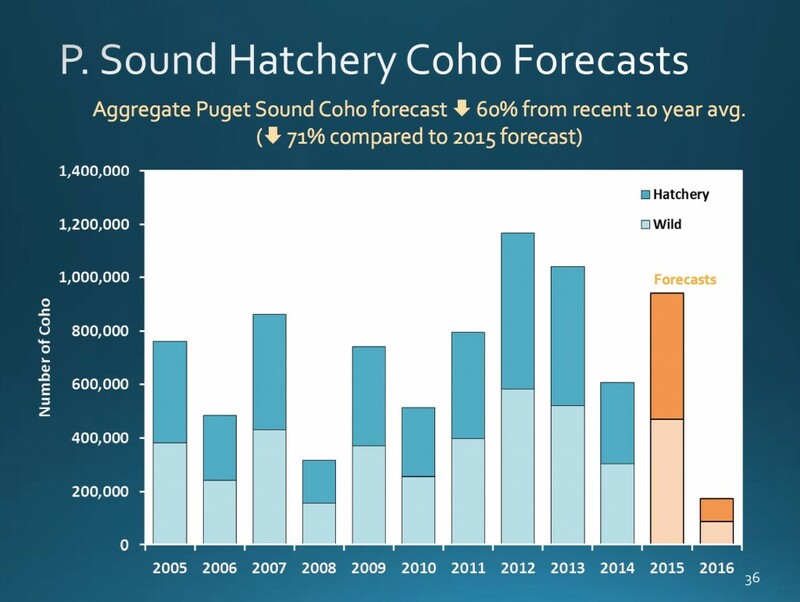 Fishing seasons for coho salmon in Puget Sound are expected to be cut back severely this year, as the latest forecasts of salmon returns predict that coho runs will be less than a third of what was forecast for 2015. 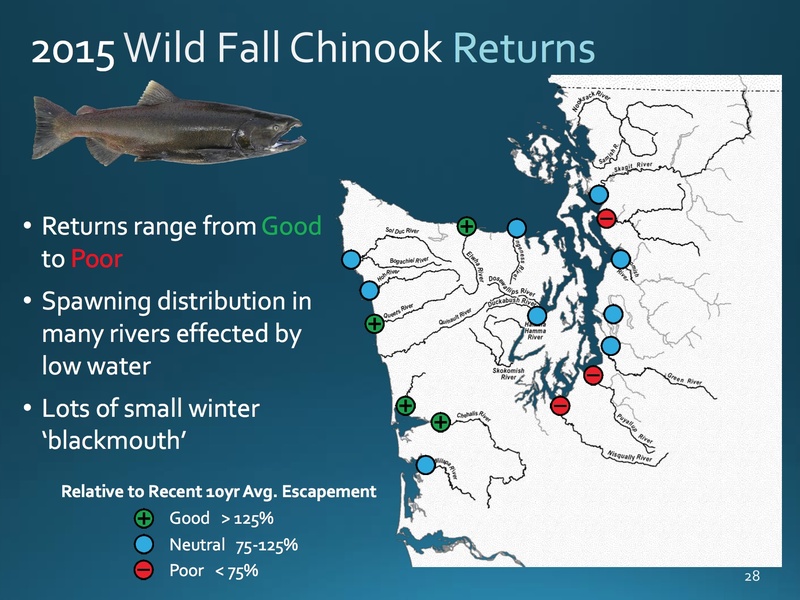 Salmon managers faced some tough facts recently when they read over results from a computer model used to predict the effects of various fishing scenarios. After they plugged in last year’s fishing seasons and this year’s coho forecast, the computer told them that essentially no fish were left to spawn in Stillaguamish River in northern Puget Sound. Things were hardly better for the Skagit or Snohomish rivers or for streams in the Strait of Juan de Fuca and Hood Canal. Last year’s fishing seasons are not even a good starting point, as negotiations begin between salmon managers for the Washington Department of Fish and Wildlife and Western Washington tribes. Under federal court rulings, the two sides must agree on fishing seasons, and the goal remains a 50-50 split of the various stocks that can be safely harvested. 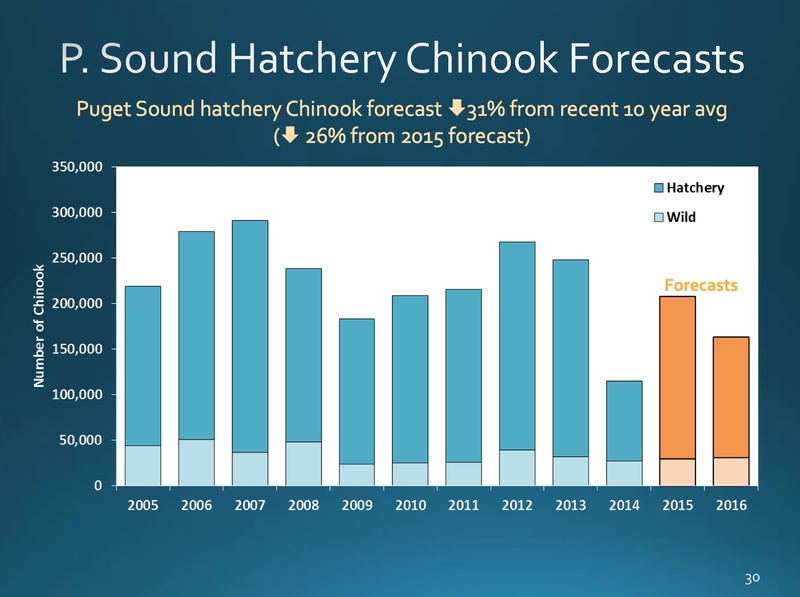 NOAA Fisheries plays a role in setting seasons for chinook, which are listed as threatened under the Endangered Species Act. Coho are not listed, although some people argue that they should be. By April 14, if things go as planned, the two parties will reach agreement on when and where salmon fishing will take place — for tribal and nontribal, sport and commercial fishers. It seems the tribes have a slightly different take on the situation. 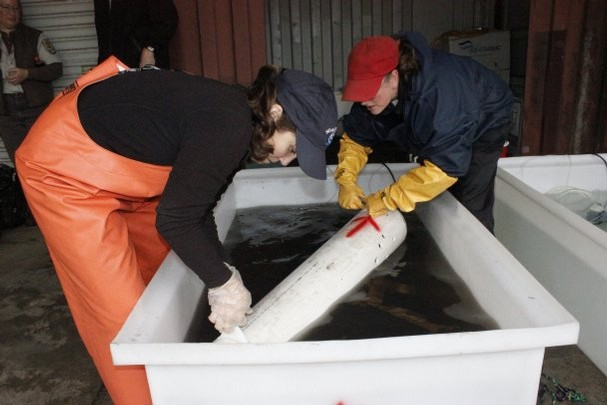 “There likely will be no coho fisheries in Western Washington this year, as returns are expected to plummet even further than last year because of poor ocean survival,” Lorraine Loomis, chairwoman of the Northwest Indian Fisheries Commission, stated in a column published online. She said that when last year’s coho returns are finally tallied, they may be as much as 80 percent below preseason forecasts. The Nisqually Tribe last year canceled its coho fishery when less than 4,000 of the anticipated 23,000 fish returned to the area, she said. Tribes fish at the end of the line, after all the other fisheries — from up the West Coast to the inside of Puget Sound. Because the treaties require tribes to fish within their “usual and accustomed areas,” agreements on fishing seasons must allow for salmon to return to their natal streams with numbers large enough for tribes to take their share, Lorraine said. The annual negotiations between the state and the tribes were kicked off Tuesday at a public meeting where the salmon forecasts were discussed with sport and commercial fishers. In addition to a poor return of coho to Puget Sound, the forecast for Puget Sound chinook also shows somewhat lower numbers than last year. One bright spot is for people who like to fish in the ocean. About 951,000 fall chinook are expected to return to the Columbia River. That’s higher than the 10-year average but lower than last year’s modern record of 1.3 million. About 223,000 hatchery chinook are expected to return to the lower Columbia River. These fish, known as “tules,” make up the bulk of the recreational harvest. 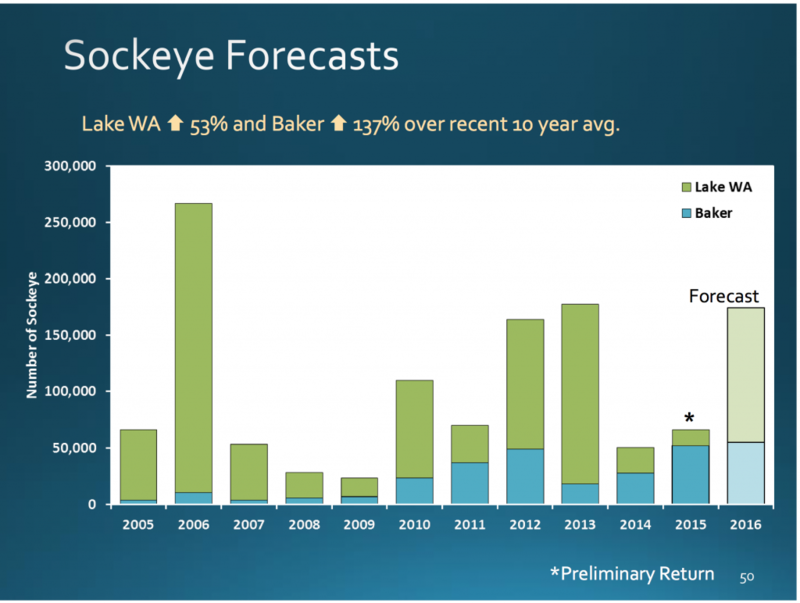 Another bright spot is the prediction of a fair number of sockeye returning to Baker Lake on the Skagit River, possibly allowing a fishing season in the lake and river. Norm Reinhardt, who heads up the Kitsap Poggie Club, has been involved in advisory groups on salmon fishing and participates in discussions about the seasons. “This year, we have a significant challenge in the coho fishery, and we will have to base decisions on conservation needs,” Norm told me following Tuesday’s meeting. Despite lower chinook numbers, there could be ways to work out some opportunities to fish for hatchery chinook, he said. Catch-and-release is one option on the table, but it is not popular among sport fishers. Anglers are still smarting from last year’s sport-fishing closure in Area 10, a designated fishing area between Bremerton and Seattle. Fishing for chinook was prohibited in that area at the insistence of the Muckleshoot Tribe to protect hatchery chinook returning to the Issaquah Creek hatchery. Fishing should have been allowed at some level — with the release of wild chinook — under an agreed management plan, Norm says, but state managers yielded to the tribe at the last minute in order to hasten a final agreement. On Tuesday, Norm told state salmon managers that he doesn’t want to see that happen again. “In area 10, our argument is going to be that if we have adequate chinook, we should be allowed to fish on our fish — unlike last year,” he said. The reduced number of coho returning to Puget Sound has been blamed on ocean conditions, including higher water temperatures off the coast and a mass of warm water called “the blob,” which stayed around for two years. Studies have shown that warmer water alters the species of plankton available for fish to eat. The result is that the fish are consuming a plankton lower in fat content, causing coho to be thinner and fewer. 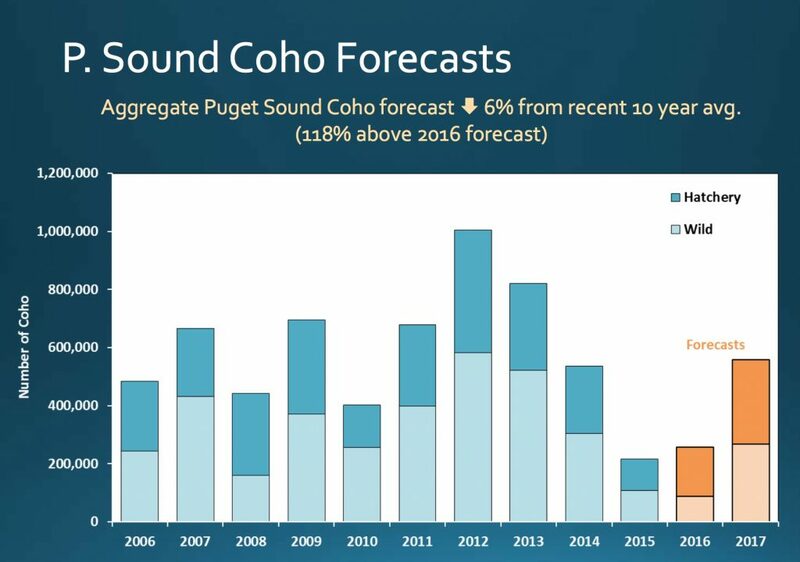 The 2016 forecast of about 256,000 Puget Sound coho is about 40 percent of the average return over the past 10 years and 29 percent of the number predicted for 2015 — a prediction that turned out to be too optimistic. Because of the failed coho forecast last year, everyone is expected to be more cautious about aspects of the computer modeling this year. Charts on this page were presented during Tuesday’s meeting. 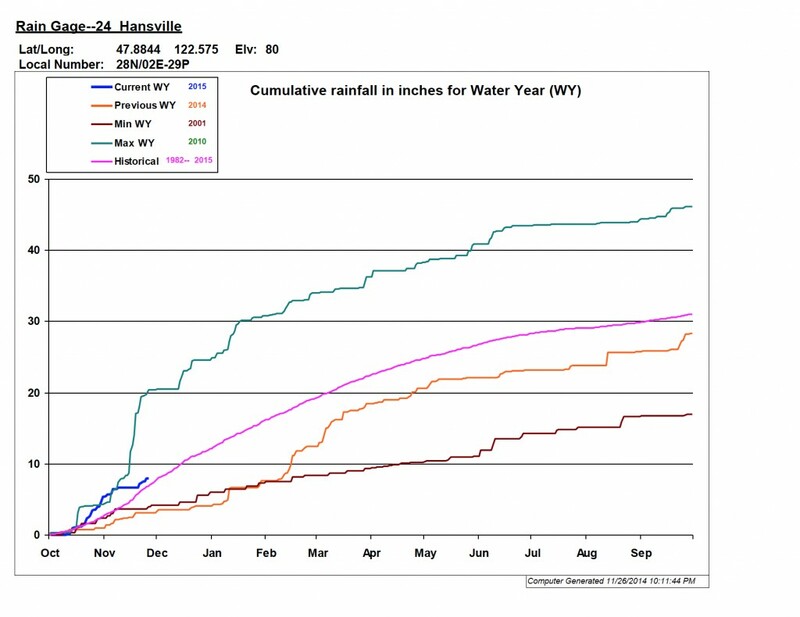 The new charts make the presentation easier to understand, compared to the tables of data discussed at previous meetings. The data tables are still available when one needs to dig into the finer details. The new maps use colors to describe how streams are doing. Poor (red) is if the run or forecast for a stream is less than 75 percent of the 10-year average. Good (green) is if the run or forecast for a stream is more than 125 percent of the 10-year-average. Neutral (blue) is if the run or forecast falls between 75 percent and 125 percent. Anyone may attend the meetings where the ongoing negotiations and possible tradeoffs are discussed. Allowing more fishing in one place often results in less fishing somewhere else, and there’s always the question about whether enough salmon are being left for spawning in the streams. Information about the salmon forecasts, the meeting schedule and methods of commenting are available on WDFW’s North of Falcon website. On March 14, various parameters for ocean fishing will be set by the Pacific Fishery Management Council, a group empowered by the federal government to manage fish in the ocean. 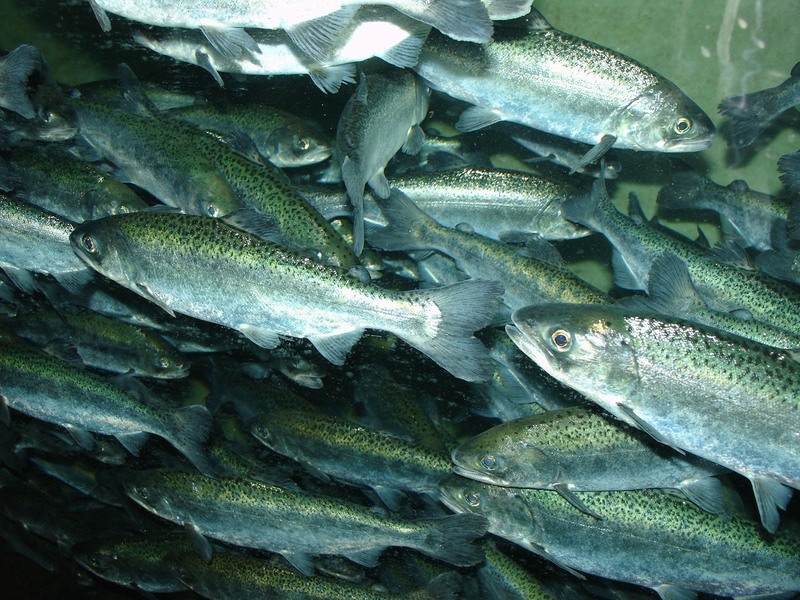 The PFMC will adopt ocean fishing schedules and harvest levels during its April 8-14 meeting, at which time state and tribal salmon managers are expected to approve fishing seasons for the inland waters. Gorst Creek is the place to go right now when looking for migrating salmon — not only chum but also coho, all decked out in their bright-red spawning colors, according to Jon Oleyar, who surveys East Kitsap streams for the Suquamish Tribe. Jon called me last night with the news the coho, which adds some excitement to the salmon-watching experience. Coho often hide along the stream edges, making them hard to spot. That’s why I generally focus the attention of salmon watchers on the more abundant chum, which race right up the middle of the streams. But it’s great when coho add themselves to the mix. Jon reported that the coho can be seen easily in Gorst Creek at Otto Jarstad Park off Belfair Valley Road. He said there were also plenty of chum, some that have been in the stream awhile and others that have just arrived. Bremerton Public Works officials, who manage the park, have not objected to people parking outside the park gate and walking into the park, where salmon-viewing platforms were built along the stream by the Kitsap Poggie Club. One good spot, Jon said, is near a pipe where water from the nearby salmon-rearing operation pours out into the stream. Salmon seem to get confused and try to jump up into the pipe before heading on upstream. 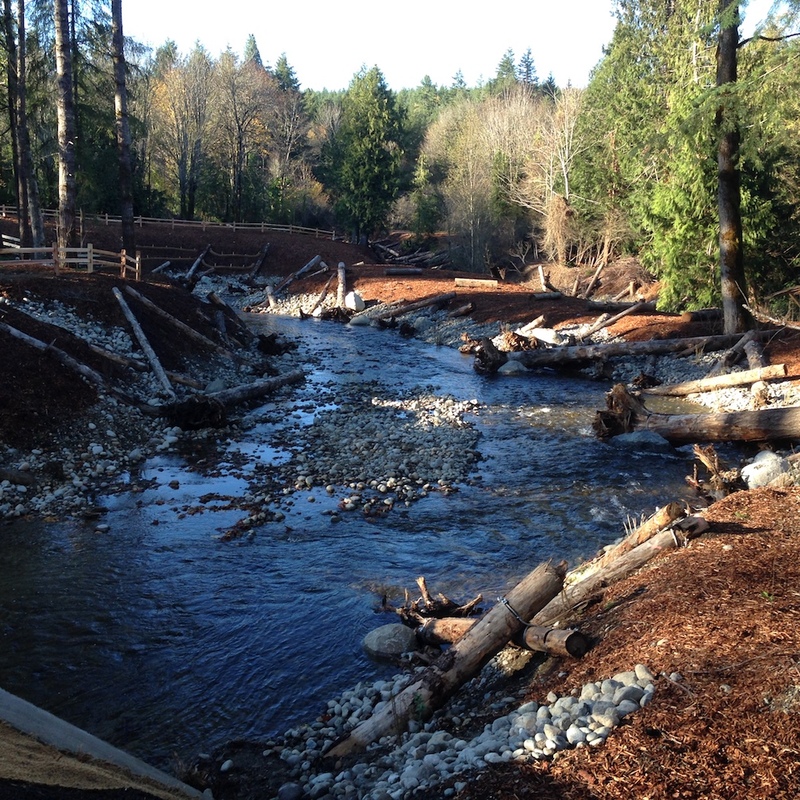 Gorst Creek contains one of the latest chum runs on the Kitsap Peninsula, and people may be able to see salmon there until the end of the year. I often tell local residents that Jarstad Park is a good place to take out-of-town visitors during the holidays. Another possibility for seeing salmon is Dogfish Creek, which runs through Poulsbo. “There might be a few stragglers in Dogfish Creek,” Jon said. It’s worth noting that the rains this fall continue to be nearly ideal for the salmon, coming in with just enough intensity and frequency to keep the streams flowing at a good level without flooding. I covered this issue in Water Ways on Oct. 31. When the rains eventually dropped off, springs created by those rains kept the streams flowing until the next rains arrived. As a result, salmon were able to distribute themselves as far upstream as they could go. That does not happen every year. A torrential downpour could still cause flooding and disrupt salmon eggs incubating in the gravel, but for now things look good on the Kitsap Peninsula. 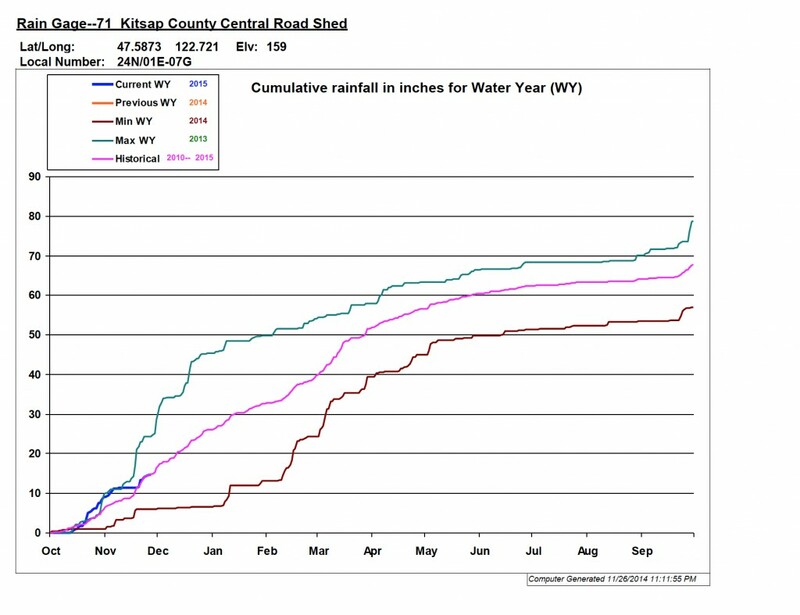 As for total rainfall, we were on a record pace for the month of October across most of the Kitsap Peninsula, as I reported in Water Ways at the end of last month. 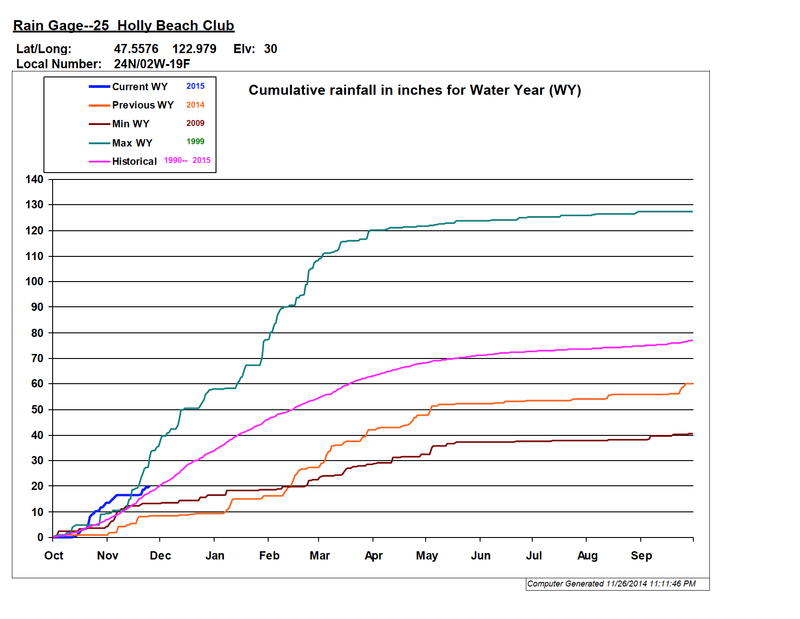 But, as you can see from the charts below, we dropped off the record pace in early November but remain above average for the water year, which begins Oct. 1. I guess it’s common knowledge among fish biologists that fish can smell death. It’s a survival mechanism. When the skin of a fish is damaged, a substance is released into the water. Other fish smell the substance and instinctively take evasive action. When juvenile coho salmon smell death, they tend to stop moving and become more wary of predators, according to a new study by Jenifer McIntyre and colleagues at the University of Washington and National Oceanic and Atmospheric Administration. But the most important finding is that the coho exposed to minute levels of copper lose their sense of smell. Their brains don’t register the smell of death, and they get eaten at a much higher rate than coho not exposed to copper. For details, check out the story published today in the Kitsap Sun. The video shows the response of coho salmon when ground-up fish skin is released into the water. Coho not exposed to copper freeze, as you can see in the upper tank. Coho exposed to copper keep on moving, as if unaware of the danger, making them prime targets for predation. These are interesting findings, but more research is needed to determine what levels of toxic copper may actually be found in urban streams, where copper typically comes from brake pads and pesticides, and rural streams affected by mining operations. 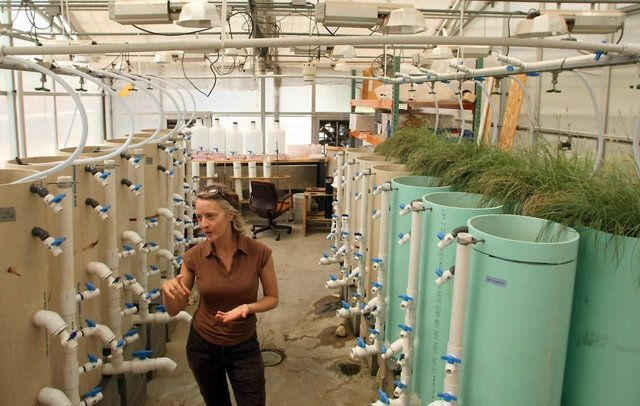 “Effects of Copper on Aquatic Species: A review of the literature” by Phyllis Weber Scannell.